Aguiar P, Moriarty T, Baracho W, et al. The accuracy of two equations for predicting maximal oxygen uptake on individualized ramp protocol. Human Movement. 2018;19(4):42-48. doi:10.5114/hm.2018.77323. Aguiar, Paula F., Terence A. Moriarty, Wesley A. Baracho, Fabricio De Paula, Pamela F.M. Sampaio, Vinicius O. Ottone, and Marco F. Dias-Peixoto et al. 2018. "The accuracy of two equations for predicting maximal oxygen uptake on individualized ramp protocol". 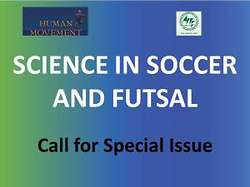 Human Movement 19 (4): 42-48. doi:10.5114/hm.2018.77323. Aguiar, Paula F. et al. "The accuracy of two equations for predicting maximal oxygen uptake on individualized ramp protocol." Human Movement, vol. 19, no. 4, 2018, pp. 42-48. doi:10.5114/hm.2018.77323. Aguiar P, Moriarty T, Baracho W, Paula F, Sampaio P, Ottone V et al. The accuracy of two equations for predicting maximal oxygen uptake on individualized ramp protocol. Human Movement. 2018;19(4):42-48. doi:10.5114/hm.2018.77323. Valid protocols use nomograms based on standardized stages to calculate maximal oxygen uptake (VO2max). Although the maximal ramp exercise protocol offers advantages over traditional protocols, it is not known if the non-standardized stages approach affects the accuracy to estimate VO2max. The study aims to examine the accuracy of 2 equations for predicting VO2max in a maximal ramp exercise test. Overall, 11 men (age: 26 ± 5 years, height: 178 ± 7 cm, weight: 77.6 ± 9.9 kg) underwent 3 sessions of a maximal ramp test on a motorized treadmill; the speed increments were equal but with 0, 3, and 6% grades. Expired gases were analysed with a portable metabolic system. The VO2max measured was set as the highest mean value observed from 7 consecutive breaths and it was predicted from 2 equations: American College Sports Medicine (ACSM) and Myers. VO2max predicted by ACSM equation (54.3 ± 6.7 mL • kg–1 • min–1) was approximately 10 ± 10% higher and by Myers equation (30.6 ± 6.1 mL • kg–1 • min–1) approximately 38 ± 11% lower than directly measured (49.6 ± 6.7 mL • kg–1 • min–1, p < 0.05). Bland-Altman graphs indicate low and no agreement for ACSM and Myers equations, respectively. The calculated standard error of the estimates was 6.5 mL • kg–1 • min–1 for ACSM equation and 19.9 mL • kg–1 • min–1 for Myers equation. The ACSM and Myers equations significantly over- and under-predict the VO2max of young adults, respectively. Although the former overestimated VO2max, we recommend its use with caution.